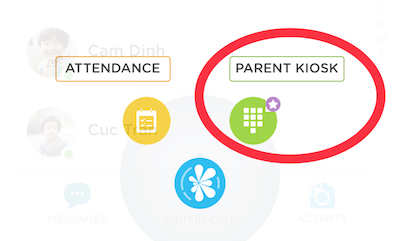 Kinderlime provides quick and easy ways for parents to sign their children in and out in order for your center to maintain accurate attendance records and charge families properly (if you have attendance-based charges). Parents CAN NEVER sign in-out while logged into their own account, only from a tablet that has been logged into by a staff member or admin of your school. Click here for more information about what parents can do from the app. Click on logo at the bottom of the app to open the Parent Kiosk (see screenshot below). After choosing the correct pickup person, they will be able to record sign-in or sign-out of the child along with digital signature. Click here for details on how to enable/disable parent signatures. 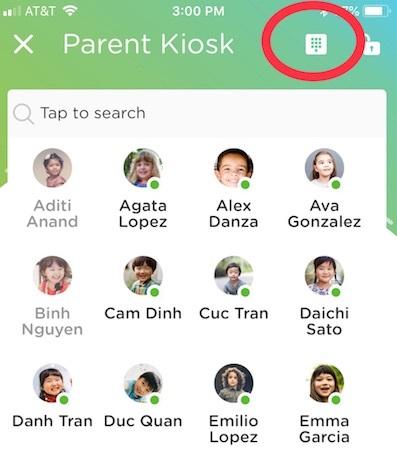 Parent Kiosk screen can also be locked to keep parents from being able to navigate away from the screen (the teacher or admin password is required to unlock this screen). Click here for details on how to enable/disable the password protection. Each parent or authorized pickup has a 4 digit pin which they will use to drop-off or pick-up their child. The pins are automatically assigned by the system when they are added either on web or mobile. Click on the keypad icon in the upper righthand corner to access the Sign-In Kiosk screen (circled in red below). Once pin is entered and validated, they will be able to do Sign-In or Sign-Out of their child in the next screen. You can use any of the above options depending on your needs. If you are new to Kinderlime, we recommend to get started with Option 1 (without pin). It will help you get started quickly without parent pins. Once you have started using our system for sometime, you can move to option 2 which helps in doing sign in-out quickly and more securely. You will always have both these options for Parent Kiosk.